There are a number of online and published resources providing background to the history and etymology of Aboriginal words and place names spoken in Sydney and NSW. Many of the First Fleet diarists, including David Collins, Daniel Southwell and William Dawes, created wordlists of the local Aboriginal language in Sydney. Second Lieutenant William Dawes’ language notebooks, produced within the first three years of British colonisation, are the most extensive record of the original language spoken by Aboriginal people at Sydney. 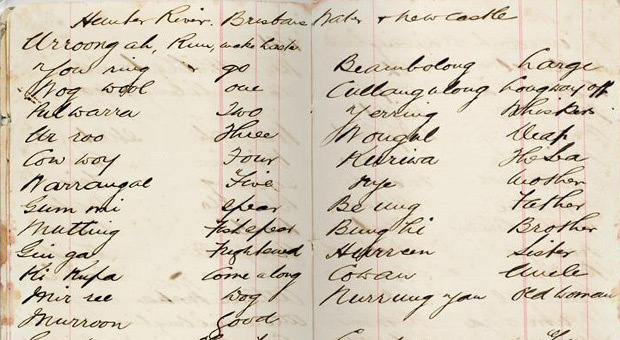 The notebooks recorded local language and culture shared by Aboriginal people. The most well-known informant was a young Aboriginal woman named Patyegerang. In 1993, Aboriginal linguist Jakelin Troy wrote The Sydney Language ‘to revive interest in a long extinct Aboriginal language of the Sydney district and to make readily available the small amount of surviving information about the language.’ This publication is regarded as the most comprehensive word list of the Sydney language published and accepted by the Aboriginal community. It is particularly useful because it identifies the provenance of where the words came from. Because Aboriginal people did not have a written tradition, there are a number of different spellings for language words that have been recorded over the past 200 years. The Rediscovering Indigenous Languages project aims to make accessible the rich archival collections of the State Library of NSW. The website features historic word lists, records and other documents relating to Indigenous Australian languages. The website includes digitised word lists from the Sydney region including Dharug, Dharawal, Eora, Gundungurra, and Ku-ring-gai / Gameraigal language groups and clans. Many places around the Sydney had Aboriginal names. Some of these names continued to be used by the Europeans, though many were jettisoned in favour of English naming. Sometimes the new arrivals introduced a new Aboriginal name while ignoring the traditional one. For example, the name Dawes Point was given to the place originally called ‘Tar-Ra’. Since 2002, a number of places around Sydney Harbour have been ‘dual named’. Dual naming means that the original Aboriginal place name has been officially reassigned by the Geographical Names Board, and is recognised along with its more recent European place name. The purpose of having a dual named site is to indicate equal footing for the two names – European and Aboriginal. The dual naming policy ‘applies to already named geographical features such as rivers, creeks, waterfalls, beaches, harbours, islands, mountains and caves – specifically those cultural and environmental features of significance to the local Indigenous community.’ Dual naming is an important way to support and recognise Aboriginal cultural heritage. For more information on dual naming, visit the Geographical Names Board website. The Australian Museum website has a place names chart that includes current place names, references and historical names and descriptions. These places within the City of Sydney local government area (LGA) have been officially gazetted as dual named sites by the Geographical Names Board. Here are some other Aboriginal place names around Sydney Harbour. These names have not been officially dual assigned by the Geographical Names Board but knowledge is increasing as more research comes to light. For an understanding of how place names have been chosen for dual naming from 2002 onwards, check out the chapter by Jakelin Troy and Michael Walsh in the 2009 publication Aboriginal placenames: naming and re-naming the Australian landscape. These words are sourced from Jakelin Troy’s The Sydney Language published in 1994.